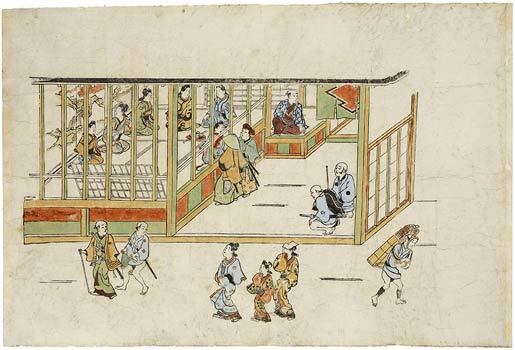 From the 12-print-series "Scenes from Yoshiwara" This print shows the entrance area to a brothel where two samurai are negotiating with one of the girls waiting behind a grate, while their two knaves (ashigaru) have taken their places off to the side. The clear composition of Moronobu’s images emphasizes the essential aspects and establishes the relationships between the depicted figures as if on a stage set. Around 1700 the city of Tokyo, which a hundred years previously had consisted merely a collection of a few houses, had become one of the biggest cities of the known world, with half a million inhabitants. This development was accompanied by the growth of a new, self-confident middle-class together with the emancipation of a middle-class ethos, which transformed the concept of ukiyo-e as a transitory world lacking in gradification into its opposite. Ukiyo now stood fort he floating world; since life here is so short, one should grasp every opportunity and enjoy it to excess. The favourite means to this end were the theatre and the brothel, and these were to become the chief subject matter of ukiyo-e artists’ pictures in the following hundred years. Moronobu’s earliest large-scale woodblock print series, which were liberated from the tradition of book illustrations, answered an avid demand for illustrations of the famous pleasure houses and the favourite courtesans. At the same time, they established the accepted form of ukiyo-e woodblock prints fort he next two centuries, drawing on the tradition of ukiyo-e paintings, which was already flourishing. Ueno-hanami-no-tei (Flower-Viewing at Ueno) from 1680 and Yoshiwara-no-tei are two examples of such series. In Yoshiwara-no-tei the viewer of the series of pictures is led, like a visitor, through all twelve scenes: on the way to Yoshiwara, entering through the great gate, sojourning in the prostitute district, the courtesans and their guests in the ante-chambers, the interior of the brothels, a glace into the kitchens, and finally the guests departing into the distance. Our leaf (leaf seven) shows the reception room of a brothel, where expectant guests pass in and out, and can approach the ladies of their choice. At the centre, in front of a room separated from the street and the ante-chamber by an open window, a samurai is standing, his face hidden under a large straw hat to avoid recognition. The pretty girls sitting on tatami mats making music, and the large mural with landscape and waterfall are intended to give a cozy impression. The composition of the picture is simple and described with an instinct for the essential. As on a theatre stage, Moronobu succeeds in relating all the participating actors to one another; they interact in an exciting juxtaposition of full and empty planes within the picture.